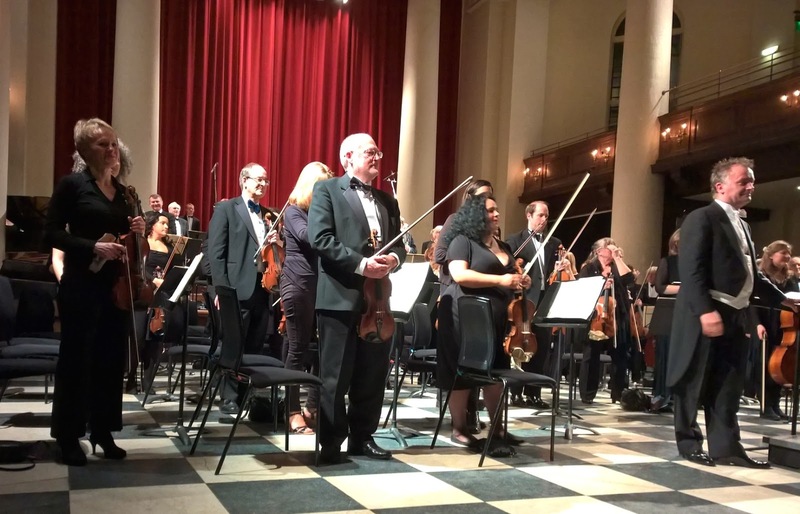 As one of London’s premiere non-professional orchestras, the Salomon Orchestra’s concerts are always an event and their recent concert at St Johns Smith Square on 3 February 2016 was no exception. 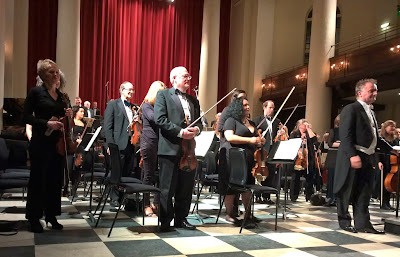 Conducted by Robin O’Neill the orchestra played a challenging programme which included Dvorak’s rarely performed tone-poem The Noonday Witch, Brahms’ Double Concerto with Zsolt-Tihamér Visontay, violin, and Timothy Walden, cello, and Shostakovich’s Symphony No. 5. The result was typical Salomon performance in which the large orchestra filled St Johns with vibrant sounds, and the players enthusiasm really communicating itself to the capacity audience. Dvorak’s The Noonday Witch was one of a group of tone poems written by the composer in 1896 after the Cello Concerto. Based on a poem by Karel Jaromír Erben, the work is a rare excursion by the composer into narrative orchestral music. The work is full of imaginative colours and tonal combinations as the composer tells the story of the impatient mother who threatens her fractious child (a nice oboe solo here) with the noonday witch only for the witch to appear and kill the child. Whilst Dvorak does use folk-type melodies these are woven fluidly into the drama giving the orchestra the chance to give the music an engagingly lively rhythmic lift. Perhaps the most striking moment is witch’s appearance, with the combination of bass clarinet and eerie strings. For all the orchestra’s big vibrant sound at key moments, there were some lovely subtle (and eerie) ones too with a great sense of the colourful narrative. Brahms’s Double Concerto was written for the great violinist Joachim, and was something of a peace offering as the two’s relationship had fractured after Joachim’s divorce. Unusually the work starts with cadenza-like solo passages before the main sonata-form movement gets under way. The two soloists Zsolt-Tihamér Visontay and Timothy Walden both play in the Philharmonia Orchestra (an orchestra with whom Robin O’Neill is principal bassoon), with Vistonay being concert-master and Walden leader of the cellos. Walden played from an extremely battered part which you felt might have many stories to tell. The soloists sense of collegiality counted for a lot during the performance of the concerto (especially as Robin O'Neill is a fellow colleague) with the sense of Visontay and Walden being comfortably used to each other and almost answering each other’s phrases, and both playing with the same sense of classical poise and considered elegance to offset the concerto’s romanticism. The soloists approach in the first movement wasn’t over romantic, but their performance was never driven and had a lovely relaxed quality, which was nicely contrasted with the vigorous sweep of the larger orchestra moments. The work gives some nice moments for individual wind players to shine, with vivid comments on the solo passages. Throughout Robin O’Neill kept the momentum going, but with a sense of vibrato and encouraging a big boned account of the movement from the orchestra. The second movement had a lovely sweep to the glorious unison tune from the soloists, and a nice warmth from all performers. The soloists played with a strong yet flexible sound and I really enjoyed the way they passed the phrases between each other with a real sense of communication rather than competition. O’Neill’s tempo for the final movement was quite steady, but he brought out a strong rhythmical undertow from the orchestra, with a brilliance in the sound. The soloists with their fine articulation brought out the underlying Hungarian influences in Brahms’ melodies. This was a vividly involving account of the work, with the soloists making a superb double-act. Shostakovich’s Symphony No. 5 was the work he wrote after the criticism of his Symphony No. 4 and his opera Lady Macbeth of Mtsensk. The fifth symphony is a sober, well wrought work which is written on a large scale, and where the underlying sense of anxiety is never far away even in the more upbeat moments. O’Neill’s overall interpretation brought this out, as he encouraged the orchestra to play with brilliant incisiveness and he clearly relished the big sound that they made in the confines of St Johns Smith Square (as did the players), though the effect was always one of discipline and order. The first movement opened with strong intent, steady and sober with a sense of inevitability, but the intensity grew as O'Neill turned the screw, particular with the wind players. The development transformed the speeds, combining intensity with a violent edge. There was a terrific sense of barely controlled energy. The re-capitulation's duet for horn and flute was almost consoling, but there was an unnerving quality to the tranquillity. The scherzo was wildly ironic, with a strong vibrant sound from the orchestra which gave a different cast a movement which can seem Mahlerian. But the trio was gentle yet still with marked rhythms. The slow movement had a sombre, sober sense of counterpoint and structure. There was tension too and O'Neill never let this up, with only the lovely flute solos for cooling contrast. The final movement was hectic and angry, full blooded and full of heavy Shostakovich irony. The noisy anger was off sett by quietly intense moments but it never really relaxed. And the final almost radiant passage in the major was rendered all the more unnerving by the sheer insistence of the strings' repeated notes. Throughout the orchestra brought a big bright edge to the sound, and they and Robin O'Neill brought out the unnerving qualities to the work. It was wonderfully loud, yet never rousing.